Interconnected events concerning five unrelated individuals lead to one fateful car crash. 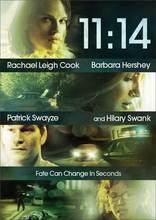 Five separate individuals, each with their own unrelated backgrounds, concerns, and motives, take part in a series of events leading up to one unfortunate car crash at 11:14 P.M. Stories concerning three careless joyriders, a man making a disquieting discovery in a cemetery, a paranoid drunk driver, and a man robbing his friend's store to pay for a young woman's abortion are presented to the viewers, each connected to produce a devastating final act.